Yesterday I got to see Lewis Hamilton in the flesh. He sat about five foot away from me. For about 20 minutes. I think he may even have looked at me. I turned up the Indiblogger meet at the Grand Hyatt in Santacruz not knowing a soul. I immediately hooked up with a very pretty girl standing on her own - who happens to be a model and one of the biggest fans of Lewis Hamilton in India (and also writes a blog about Formula 1). As we had turned up early, The Model and I got seated straight away - right on the front row. I would not normally want to draw attention to myself but she was keen to be at the front as she is a self-confessed semi-stalker of Lewis Hamilton. I think she would be OK with me saying this. Once all the other invitees had eventually arrived - about an hour later, we had a little speech given to us by the Indiblogger team and a representative of Vodafone. They assured us Lewis Hamilton would indeed be turning up to meet us. It was at this point that I turned around and realised that I was not only one of the oldest people in the room but also the only non Indian! errr.....I won't if you don't mind! Then some instructions came up on the screen..."Wave your Hands in the Air!!"... "Hug Every Blogger in Sight!!".... "Let's Have a Ball!" Oh my god....I'm at an EVANGELICAL CONVENTION! Seriously I was getting very scared. I thought blogging was a harmless past-time not a cult religion! And there was far too much bodily contact for my liking! Even more scarily, each of us then had to stand up and say everything we could about ourselves in 30 seconds. Being right at the front, everyone could see me. Aaaaagh. The Indiblogger motto is "Indian by Birth, Blogger by Choice"....so as part of my speech I said "I am not Indian by birth, just in case you haven't noticed! "...I didn't get much of a laugh. As there were almost 200 of us in the room the introductions went on for some time. However, through this exercise I at least came to realise that my blog is not the most boring one out there. Some people write about engineering, maths and physics! Oh, and I wasn't the oldest person there - someone was 63. The youngest was 14. Then we broke for lunch. I hung out with the fashion bloggers, all of which were young enough to be my daughters. But I have to thank them as I would definitely not have made it through the day without them (plus they made me look cool). After lunch there was another networking type exercise. We were all given a big sheet of paper and then told to go around the room, to ascertain the blog details of at least another 20 bloggers. Despite feeling extremely uncomfortable (and pale-skinned), I was very proud of myself as I managed to get 35...lots of people came up to me and The Model (note to self, hang out with models more). After a bit more time wasting...the atmosphere suddenly became electric...the room went silent, doors were being opened and closed, people were running back and forth, the hotel manager swung past looking stressed...was LEWIS about to come in???? The Model was literally on the edge of her seat, chewing gum so fast I thought her teeth might fall out. Then the Indiblogger team got up on the stage and started making grunting noises and waving their arms. "MAKE A NOISE"!!!! AAaaaaghhh!! Then he appeared! Like a vision! He was actually in the room with insignificant US! Everyone rushed forward with their cameras. Lewis looked very calm and composed and even said that it was the warmest welcome he had ever received! (Boy, those PR people have trained him well). 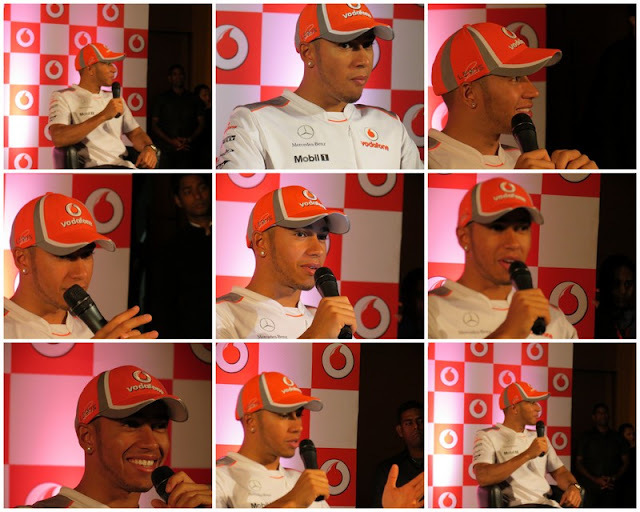 Then there was a question and answer session with Lewis. Unfortunately most of the Indibloggers had already admitted they weren't that interested in Lewis or Formula 1....they were just there to meet other bloggers and for the free food. So I know they didn't care what he had to say, they just wanted the photos for their blogs. A bit like me then. So here are the photos of Lewis. He does have lovely skin. Alongside another McLaren F1 Car. Vodafone sure were good with the props. A very lucky girl, who had written a blog post about why she would like to do a lap in a car with Lewis Hamilton won the prize of a lap in a car with Lewis Hamilton. She was so choked she couldn't speak. I felt very pleased for her because as least she was very passionate about Lewis Hamilton, McLaren and F1. A well deserving winner. After Lewis had gone, there was a bit more milling around before we were all then taken to the Mumbai Speedfest in Bandra Kurla. An event where Lewis would drive up and down the streets in his McLaren F1 and do a few doughnuts. I am not going to write loads about this. Needless to say, we had to wait around for hours for the event to kick off, endure some crappy carnival acts and bad compering, finally watching Lewis whizzing around whilst it rained. It was impossible to get photos of the car, as it was obviously just too fast! (although I did get some good video footage). The roar of the engine was very impressive but I just wanted to get home and out of the crowds by this point. The rain...and Hamilton's car...simply too fast to photo! Thank you so much to the Indiblogger/Vodafone team for organising such an amazing event for us. Despite sounding cynical, I enjoyed meeting people from the blogging community and everyone welcomed the only non-Indian there with such open arms. I just wish I was more into party games!! I curse myself so much, missed out on this event! Though, I was there to witness him run his car on Mumbais streets. Was a great event for any F1 enthusiast. Ofcourse, minus all the initial carnival actd and the zoozoo stuff. Swaraj I so nearly emailed you to check if you were signed up to this! It was a great day...next time there is a meet (that is of interest) we must hook up! WOAH! You got to meet (sorta!) Lewis Hamilton.... That is bloody fantastic. I work with a sports data/content firm, hence the enthusiastic comment. I'm not much of a F1 fan, but due to work, I've managed to follow it a little in recent years. Super post, and absolutely loved your photos. Which camera do you use? It was really great - to sit up so close. He seemed really nice as well but I am not sure if that is just the PR. I actually used my husband's camera for this as it has a really good zoom. A Canon Power Shot SX40HS. He likes birdwatching so it's useful for that. For all my other posts I have used my camera which is a Sony Nex-5 - it's a mini SLR point and shoot and I love it. It's small enought to fit in my handbag and use one handed. I struggle with the night time settings though...need to get some practice. My Sony doesn't zoom so good being an SLR but you can zoom in on the screen and it doesn't loose quality. Very crisp.